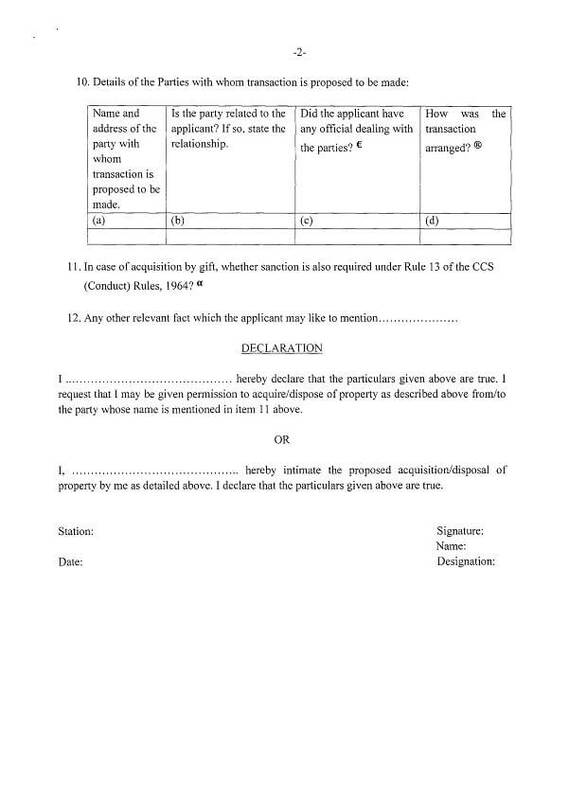 The undersigned is directed to say that in accordance with the provisions of sub­ rule (2) of the Rule 18 of the CCS (Conduct) Rules, 1964, all Government servants coming within the purview of these Rules are required to make a report to the prescribed authority before entering into any transaction of immovable property in their own name or in the name of a member of family. If the transaction is with a person having any official dealings with the Government servant, the Govt. servant is required to obtain prior sanction of the prescribed authority. Sub-rule (3), ibid provides that all Govt. 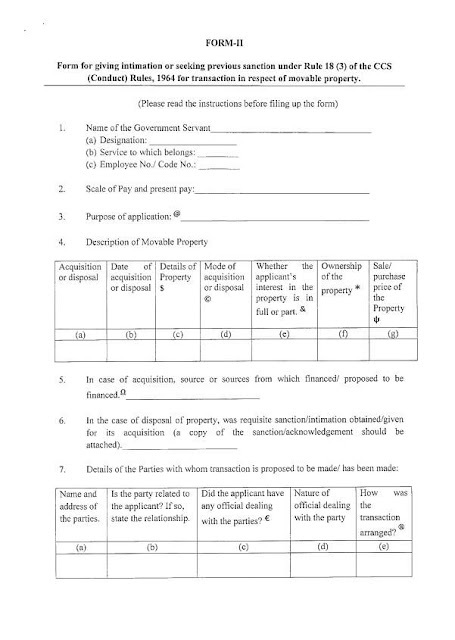 servants should give an intimation to the prescribed authority within one month of entering into any transaction of movable property, the value of which exceeds the monetary limits prescribed in that Rule. In case any such transaction is with a person having official dealing with the Government servant, prior sanction of the prescribed authority is necessary. 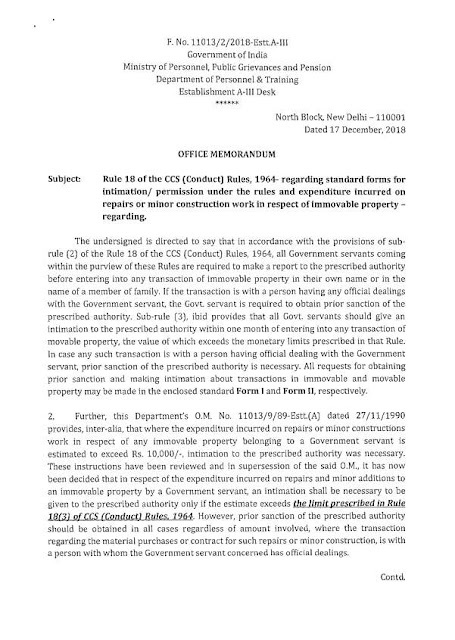 All requests for obtaining prior sanction and making intimation about transactions in immovable and movable property may be made in the enclosed standard Form I and Form II, respectively. 2. Further, this Department's O.M. No. 11013/9/89-Estt. 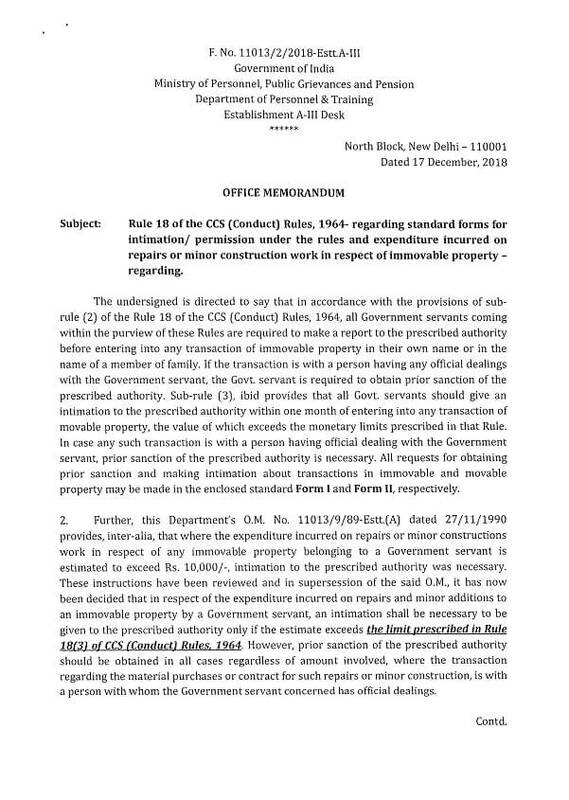 (A) dated 27/11/1990 provides, inter-alia, that where the expenditure incurred on repairs or minor constructions work in respect of any immovable property belonging to a Government servant is estimated to exceed Rs. 10,000/ -, intimation to the prescribed authority was necessary. 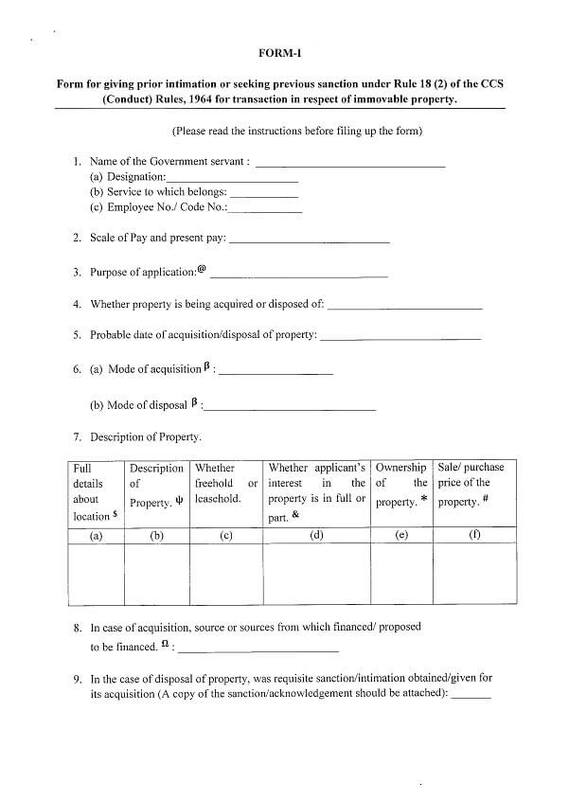 These instructions have been reviewed and in supersession of the said O.M., it has now been decided that in respect of the expenditure incurred on repairs and minor additions to an immovable property by a Government servant, an intimation shall be necessary to be given to the prescribed authority only if the estimate exceeds the limit prescribed in Rule 18(31) of CCS (Conduct) Rules, 1964. However, prior sanction of the prescribed authority should be obtained in all cases regardless of amount involved, where the transaction regarding the material purchases or contract for such repairs or minor construction, is with a person with whom the Government servant concerned has official dealings. 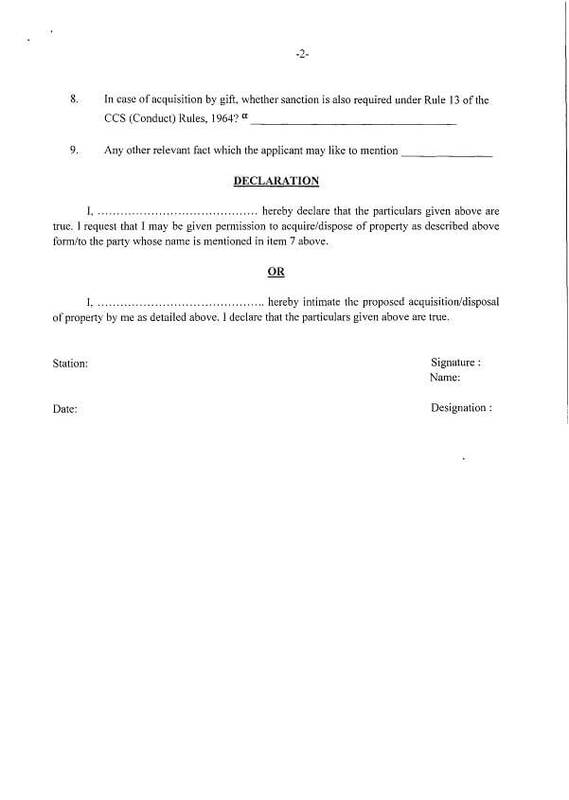 Name and address of the party with whom transaction is proposed to be made. Is the party related to the applicant? If so, state the relationship. Purpose of application: sanction for transaction or prior intimation of transaction. Mode of acquisition/ disposal: whether Purchase/ sale/ Gift/ Mortgage/ Lease or otherwise should be mentioned. Full details about location viz. Municipal No., Street/Village, Taluk, District and State in which the property situated. Type of Property: Housing and other buildings or Lands. Whether applicant's interest in the property is in full or part, in case of partial interest, extent of such interest must be indicated. Ownership of the property, in case transaction is not exclusively in the name of the Government servant, particulars of ownership and share of each member may be given. In case of acquisition, Source or sources from which proposed to financed:- (a) Personal Savings or (b) other sources giving details. How was the transaction arranged? (Whether through any statutory body or a private agency through advertisement or through friends and relatives). Full particulars to be given. Write the answer in YES or NO. 4. Description of Movable Property. I, ...... ...... .............................. hereby declare that the particulars given above are true. I request that I may be given permission to acquire/dispose of property as described above form/to the party whose name is mentioned in item 7 above. I, . .............. ...... ............... ........ hereby intimate the proposed acquisition/disposal of property by me as detailed above. I declare that the particulars given above are true. 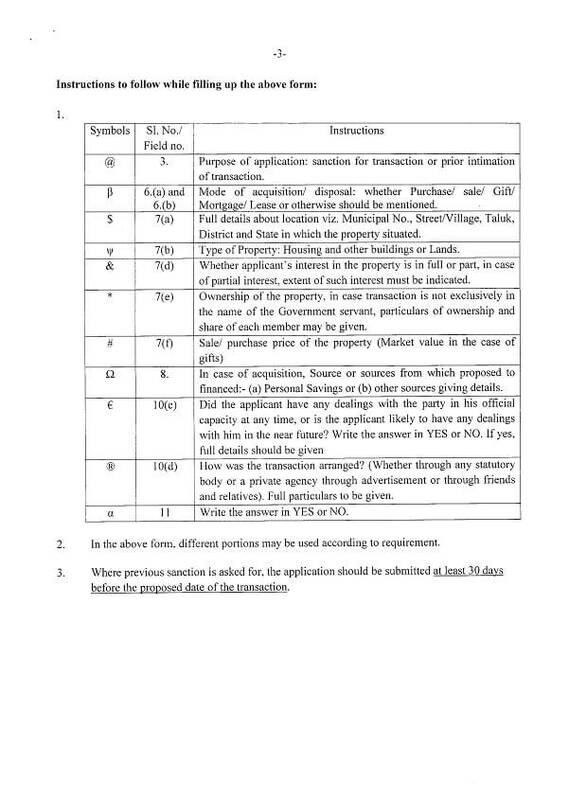 @ 3 Purpose of application: Sanction for transaction or prior intimation of transaction. © 4(d) Mode of acquisition/ disposal- purchase/ sale/ gift/ mortgage/ lease or otherwise. 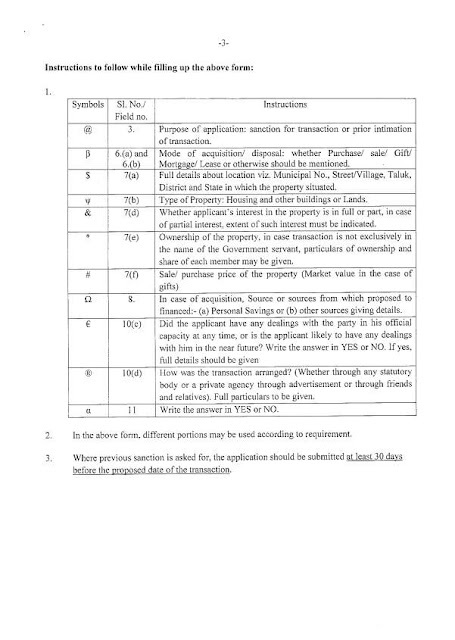 & 4(e) Whether applicant's interest in the property is in full or part, In case of partial interest, the extent of such interest must be indicated. 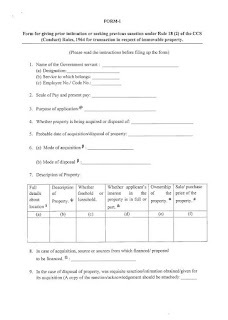 * 4(f) Ownership of the property, in case the transaction is not exclusively in the name of the Government servant, particulars of ownership and share of each member may be given. Ω 5. Source or sources from which financed/ proposed to financed:- (a) Personal Savings or (b) other sources giving details. a 8 Write the answer in YES or NO.